Following the demise of the Premier League, previously screened by SkySports, last season saw Matchroom Sport launch a new invitational event, the Champion of Champions, over on ITV4 and with a big prize fund and the feel of a ‘big’ event generally, it was well received by both fans and players alike. With Clive Everton, Neal Foulds and Alan McManus on hand to provide a mixture of commentary and studio analysis, ITV4’s coverage proved to be refreshing and universally popular amongst snooker fans and happily the same team will be back at the Ricoh Arena in 2014. As was also the case last season, the tournament format will see four groups take place, although to all intents and purposes this is simply a last 16 set-up, with a quarter-final to place at the end of each day. Due to ITV4’s coverage of the Europa League football, there will be no play on Thursday, with the final group set to be played on Friday. So how do the sections look? 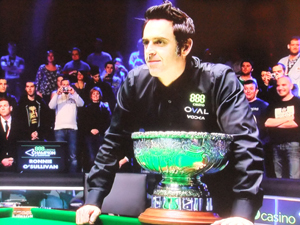 Group one takes place on Wednesday and will begin with a match between Ronnie O’Sullivan and Stuart Bingham, a repeat of the 2013 final which proved to be so close, before O’Sullivan won the last two to claim a 10-8 victory. 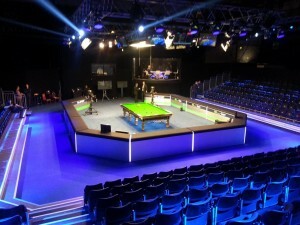 While Ronnie will inevitably come into the match as favourite, given Stuart’s impressive start to the season with victories in Shanghai and Haining, as well as the belief that he will have following his convincing victory against Ronnie at last season’s UK Championship shortly after their Coventry final, I expect a close match here. From what I saw of O’Sullivan in Chengdu, he looked to be scoring well at times, but also understandably ‘rusty’ at others, given the limited amount of snooker that he has played so far this season. 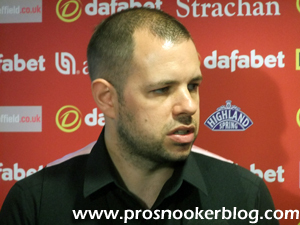 Of course, Ronnie is a man who has won a world title without having played a match for several months, but having already won 31 matches this season, there is a case to say that Stuart should be the sharper of the two. 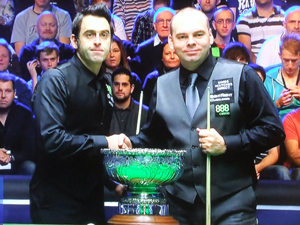 On the flip side of course, although Bingham was able to win their last meeting, it was O’Sullivan who had won their previous five and at an event that he seemed to enjoy last season, I would expect him to be motivated and looking to close the gap to Stephen Hendry on the all-time centuries chart further. Whoever can come through that one will face either Shaun Murphy or Marco Fu, who meet in a repeat of their last 16 match at the World Championship earlier this season. Of the two, Shaun has enjoyed the stronger season to date, winning the recent ET3 event in Sofia, while also reaching the final of the invitational General Cup in Hong Kong, beating Marco 4-2 along the way. Marco meanwhile was one of the most impressive players of last season and has two quarter-final runs to his name in full ranking events this season, including at this week’s International Championship, where he narrowly lost out 6-5 to Robert Milkins. 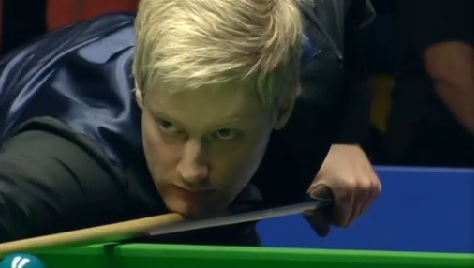 A difficult one to call, in part due to the unpredictable nature of Fu’s form, given the fact that Murphy has already beaten Fu at the Masters and World Championship in 2014, I would have to give him the edge and fancy him to make it a hat-trick in Coventry. Group two sees the return of Steve Davis to our television screens for the first time since his relegation from the main tour, as he qualifies for the Champion of Champions courtesy of his victory at the 2013 World Seniors Championship. Although his inclusion in the tournament has been the subject of much debate, some citing his age and the likelihood that he will not have been practising as much as the other players in the competition, I do not see his inclusion in the event as a bad thing. Yes there is an argument to say that a higher ranked player might be better for the event and normally I would probably agree, but I think that there is also something to the argument that if the field had simply been topped up by ranking as was the case last year, then you do effectively just end up with the top 16 and the same field as the Masters. Whether he can make his match with reigning world champion Mark Selby competitive remains to be seen, but knowing Steve and the professional pride that he still has in his game, he will have been practising to some degree in the last few days and his knowledge of the game will always remain. Still, I can’t see past a victory for Selby and a quarter-final clash with either Judd Trump or Stephen Maguire, who also meet in this group. 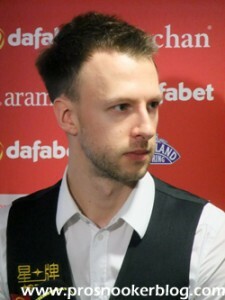 Of the two, it is Judd Trump who has enjoyed the much stronger start to the season, victory in the Australian Goldfields Open, as well as a run to the final of the Paul Hunter Classic in August. 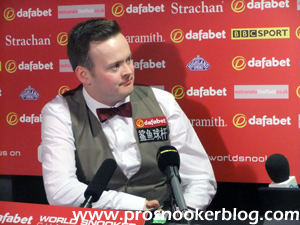 For Maguire it has been a relatively slow start to the season, although this is perhaps deceptive as of course he was able to win the Six Reds World Championship in Thailand, which is not reflected in his world ranking total. In terms of their recent head to head record, Judd Trump came out on top during their last meeting at ET2 this season, while Maguire was able to whitewash Trump at the Wuxi Classic, with a 5-0 victory at the last 32 stage. As is often the case and sounds ridiculously obvious to read, it is a case of who plays well on the day, both players are more than capable of going the way in this tournament and I feel that this is one of the harder fixtures to call in the draw. Friday sees the third group take place and a welcome return to our screens for Ali Carter, who plays his first televised match since his clash with Mark Selby at the World Championship earlier this year. He will be up against Australia’s Neil Robertson in a repeat of their incredible match here in Coventry last season which saw the pair make five century breaks between them, with Robertson edging through a 6-5 winner. Since then, they have also met at the China Open semi-finals, with Robertson winning 6-2 in Beijing, before Carter’s enforced lay-off in recent months. On paper, I would have to favour Robertson here, although since those early events in Wuxi and Bendigo, it has not gone unnoticed that his results have been below his normal standard, with seven wins and five defeats to his name since the start of August. For Ali, it will be great to see him back in action following his victory at the General Cup in Hong Kong recently and judging by his results at that tournament, we can expect him to be relatively sharp and ready to go as he steps up his comeback. Elsewhere in this section, we have a repeat of today’s International Championship final between Mark Allen and Ricky Walden, with Mark looking to make amends for his 10-7 defeat in China and Ricky hoping to take that momentum forward to Coventry and York. As was the case today, we can expect to see a close encounter that could go either way and I would find it hard to pick a favourite. Last but not least we have group four, which actually takes place first tomorrow on the opening day of the tournament. Getting the action underway will be Ding Junhui and Dominic Dale, with Ding looking to kick start his season after what has been a surprisingly slow start given the fact that he won five ranking event titles last season. Indeed to illustrate that point, a year ago in Chengdu he was in the process of winning his third straight ranking event, but this season has won only three matches in ranking events. Nevertheless, Ding remains one of the men to beat and will be favourite to progress against Dominic, who qualifies for the event by virtue of his victory at the Shoot Out back in January. Of course these two could have met at the Crucible earlier this year, but for Ding’s surprise exit to Michael Wasley in the opening round, although Ding did defeat the Welshman en route to victory at the German Masters in February. Like Ding, Dominic has struggled for victories in 2014/15 with his best run coming at the Six Reds World Championship, where he made it through to the semi-finals. 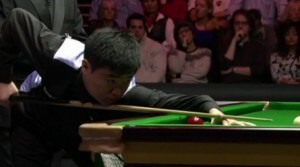 Stranger things have happened, but such is Ding’s ability that even with question marks over his form, he has to be favoured here. And finally we have a match between Barry Hawkins and John Higgins that even just a couple of years ago John would have been favourite to win, but such has been the reversal in fortunes of both players since that he comes into the match as the underdog with the bookies. For Higgins the season has so far been one to forget, falling to 12th in the latest world rankings and with a sole last 16 appearance at the Shanghai Masters representing his best result of the season to date, while Hawkins was a semi-finalist at the Wuxi Classic back in June and most recently lost out to Mark Williams in Chengdu. As Williams himself proved in Chengdu, snooker’s legends such as himself and Higgins are never to be written off, but on the evidence of John’s recent 6-1 defeat to Li Hang in China, Hawkins has to begin as favourite.